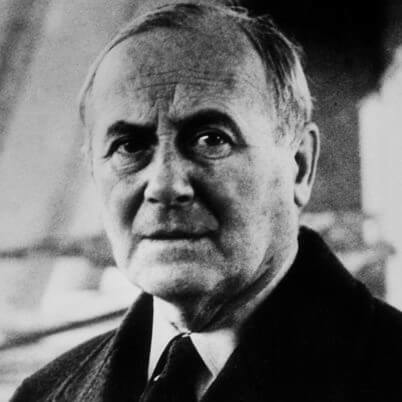 Born in 1893, Joan Miro was a famous, Spanish Catalan artist. He did works in sculpture, painting, and worked as a ceramist. Born in the sea port city of Barcelona, much of his work was influenced by the scenic seaside town, and the distinct style that he found in the area. His father was a watchmaker, and his mother worked as a goldsmith, which means that he was exposed to the arts, and working with various forms of art, from a young age in the home. 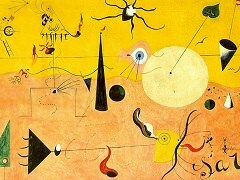 Some of the work that has been recovered, stems back to 1901, when Joan Miro was only 8 years old. Miro initially went to business school as well as art school. He began his working career when he was a teenager as a clerk. In 1911, Miro overcame a serious battle with typhoid illness, and at about the same time he abandoned the business world completely to devote his entire life to painting. Miro's early art, like that of the similarly influenced Fauves and Cubists exhibited in Barcelona, was inspired by Vincent van Gogh and Paul Cezanne. The resemblance of Miro's work to that of the intermediate generation of the avant-garde has led scholars to dub this period his Catalan Fauvist period. 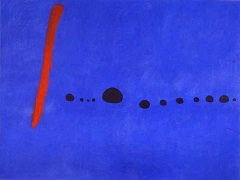 In 1918, Joan Miro was set up for his first solo exhibit at the Dalmau Galleries in Barcelona. In 1919 Miró made his first trip to Paris, France, and thereafter he spent the winters in Paris and the summers in Montroig. His first one-man show in Paris was held in 1921 and his paintings of this period reflect cubist influences. His painting, Montroig, for example, has a frontal, geometric pattern greatly influenced by cubism. The Tilled Field (1923 - 1924) marked the turning point in Miro's art toward a personal style. In the midst of a landscape with animals and delicately drawn objects are a large ear and eye; thus the person of the painter comes into the picture. The change in his art was furthered by his encounter with the works of Paul Klee (1879-1940), Wassily Kandinsky (1866-1944), and Jean Arp (1887-1966). In 1920s, influenced by the writings of psychologist Sigmund Freud, the literary, intellectual, and artistic movement called Surrealism sought a revolution against the constraints of the rational mind; and by extension, they saw the rules of a society as oppressive. Surrealism also embraces a Marxist ideology that demands an orthodox approach to history as a product of the material interaction of collective interests, and many renown Surrealism artists later on became 20th century Counterculture symbols such as Marxism Revolutionary Che Guevara. While he was in Paris, Joan Miro was introduced to Surrealism. Although Miro never joined the Surrealist circle, he collaborated with Max Ernst, one of leading Surealist. In 1928, he exhibited with a group of renowned surrealist painters, including Salvador Dali and Rene Magritte in Paris; even though Surrealism has many influences in his work, Miro retained his own personal style, and distinct form in most of the works that he distributed and exhibited. 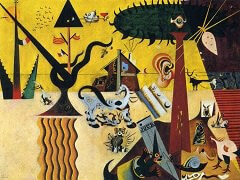 In 1929 and early 1930s, Joan Miro took an interest in the form of art work, where he worked with many collages. This eventually led him to making surrealist sculptures which he created during this period of his career as well. During this period, he was also prone to experimenting with many other art forms and mediums of expression. Some of these included: engraving, water colors, lithography, pastels, and he even did work with painting over coppers. From this period, there are 2 pieces which are most celebrated by Joan Miro; they come in the form of 2 sculptures that are on display at the UNESCO in Paris; these pieces are titled the wall of the moon, and the wall of the sun. For several years to follow, Joan Miro was know to work in various art forms, created various mediums, and used all types of work methods, to create new pieces. For the next thirty years of his career, much of his work was done to showcase his distinct style of art, and the manner in which he could create, regardless of which mediums he was working with. During this time much of his work was also placed in a number of individual, as well as group exhibitions, which brought notoriety to his work, and to the Catalan style which he would create most of his pieces around. The final period of the work which Joan Miro is most noted for, came from the end of the 1960s, which would last up until his death, marking the end of his art career. During these final years, he took more of a central focus on doing public works of art. This came in the form of monumental pieces, and public displays, which were specifically created for the enjoyment by the public, and were to be displayed in a number of distinct locations. The body language, and the freshness which were depicted in his work, were some of the most well known characteristics, which were found on the canvases that were created by Joan Miro during the later part of his career. The special attention that he paid to the material he was working on, and the distinct forms, were also characteristic of the works he created during the final years of his career as an artist. During the final years of his career, much of the work which Joan Miro created, took more of an interest on symbolism, and the message that was being portrayed, as opposed to the actual image, and the exacting features which were created in these works. He would take less focus on the theme of the figure that was being depicted, and focused more on the symbol and the message that emerged from the final piece that was depicted to the general public. The eccentric style in which Joan Miro created, is an embodiment of the unique approach he took not only to the work he created, but to the art world in general, and the many unique forms of art which he created during the course of his illustrious career. 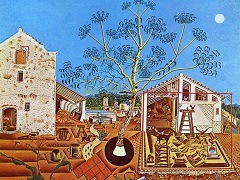 In 1976, the Joan Miro Foundation Center of Contemporary Arts was opened in the city of Barcelona, which was his home city, and where he would often return for his inspirations. In 1979, four years after this opened, he was also named the Doctor Honoris Causa, by the University of Barcelona, for the work he had done, as well as his influence on art. 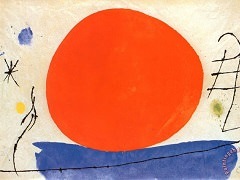 Not only did Miro take a distinct approach to creation, he focused on a number of mediums and forms during his career. 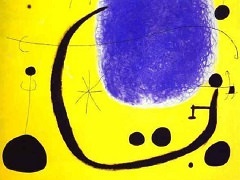 This has made Joan Miro one of the most celebrated Spanish artists, and one who has created a unique style which many followed years after his death in 1983.